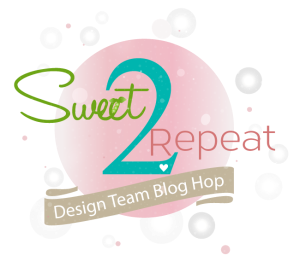 Happy Friday and welcome to the SugarPea Design Sweet 2 Repeat blog hop! Now that so many of you have the new release products we are doing a revisit to the fun and colourful Circus themed products from our February release. I used the adorable Chunky Monkey stamps and dies along with the new Starburst SugarCut Cover Plate. Colouring these cute little monkey's is so much fun. Did you know that coloring has the therapeutic potential to reduce anxiety, create focus and overall very relaxing? Fact. This is also my colouring for Day 10 of the 30 Day Coloring Challenge with Kathy Racoosin. 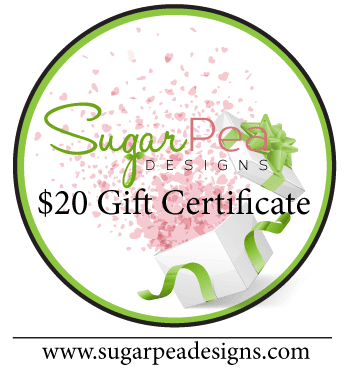 ...and don't forget to go over to the SugarPea blog for your chance to win! Adorable is right! If a human fails to smile at these two mischievous monkeys, my guess would be that they aren't human at all. So cute! This card is adorable. Thank you for sharing. 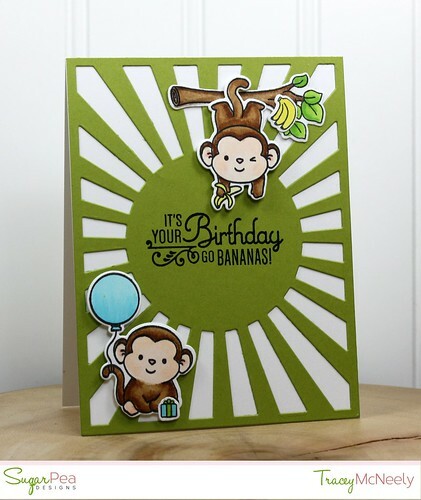 love that you added the green starburst background with the cute monkey! All of these monkeys are adorable!!! I love the coloring and the cover plate is wonderful. Very cute with the starburst design. That green, in the sunburst, is perfect! I just love your card! Love those adorable monkeys. Great use of die. This is absolutely adorable Tracey!! You picked the perfect shade of green to go with this cute little pair!! Oh how I love this fun card Tracey. I love how you used this cover plate for your background. Great card! I love the sentiment and the green starburst. This is so cute & a fun design. This is soooooooooooooo cute!!!! I love those monkeys!!!!!!!!!!! Super fun, love those chunky monkeys! 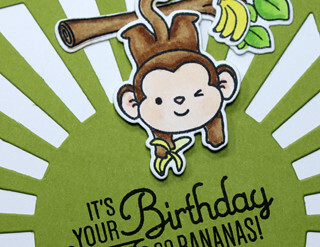 Such a darling fun card with the cute monkeys, Tracey!! Those monkeys are darling, Tracey. Those monkeys are so very adorable, and I love how they are playing on your card. This is so adorable!! I just love these cheeky little monkeys, and I love how you've used the starburst die in addition to them. Adding the little gift and bunch of bananas was the perfect finishing touch. Love those cute monkeys and your coloring! The Starburst Cover Plate makes a fabulous background and place for the sentiment! Love your choice of green for the starburst background. With the monkeys, this card is super cute. What an adorable, fun card Tracey! Too darn cute...so in love with those sweet monkeys and they look like they are having so much fun hanging out on the fabulous green cover plate die! So cute! Love the green background! Oh this is so cute...love these monkeys. Beautiful coloring on these adorable monkeys! I love that you chose green for the starburst die cut, too...such a fun card, Tracey!